Love the idea of DIY but hate the actual effort it requires? Here are some creative ways to reuse the stuff you already own. 1. Use a claw hair clip to hold a towel in place. 2. Turn teacups into plant holders. 3. Turn a colander into a flower pot. 4. Turn magazine holders into freezer shelves. 5. Use a child's floatie to protect a bottle of wine in your luggage. 6. Use a dessert stand to hold perfume bottles or jewelry. 7. Repurpose an old mailbox to hold garden tools in the backyard. 8. Use egg cartons to hold paint. 9. Use funnels as candlestick holders. 10. Use apple containers to store ornaments. 11. Repurpose fluffy socks as reusable Swiffer pads. 12. Replace your cabinet knobs with wine corks. 13. Use a pants hanger to hold up recipes while cooking. 14. Or use magnets on a cast-iron pan. 15. Hang the metal piece from a broken 3-ring binder to make a set of hooks. 16. Use old pill bottles to store cotton swabs or hair pins when traveling. There's really a bajillion ways to use these. 17. A fan + duct tape will keep your cat entertained for hours. 18. 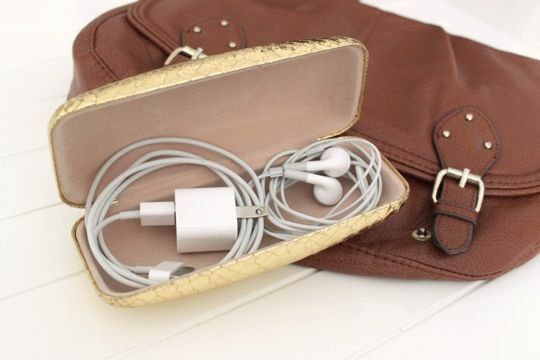 Keep cords from getting tangled in your purse by keeping them in an eyeglasses case. 19. Use a hanger to hold magazines. 20. An air mattress makes for comfy impromptu outdoor seating. 21. Turn an old drawer into a bedside table. Cleverly space-saving if you don't have space for a nightstand. 22. Spools of twine or string make great scissor holders. 23. Use a mug tree to hold scissors, spools of ribbon, or jewelry. 24. Use shot glasses as popsicle molds. 25. Use a CD holder as a dish drainer. 26. Melt down your old candles to make new, layered candles. 27. Reuse your old bottles to make bowling pins for the kids. For night time bowling, instead of painting the bottles, place different colored glow sticks into each bottle. 28. 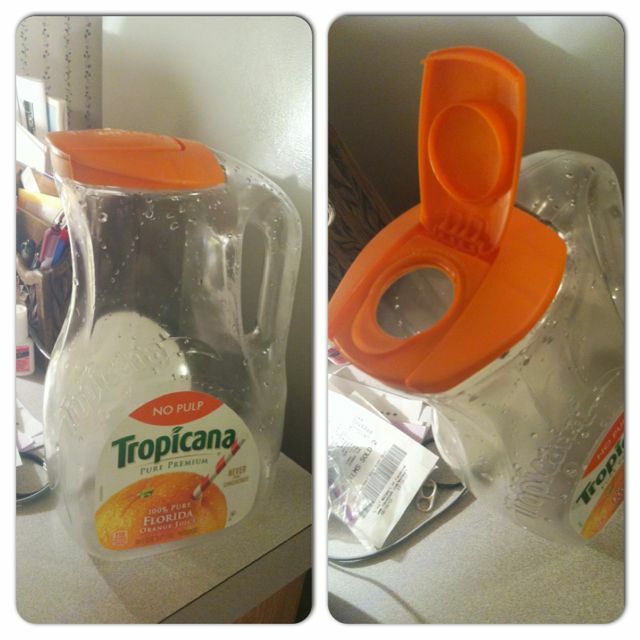 Turn an old orange juice jug into a cereal or dog food dispenser. Use cooking oil to remove the sticker. 29. 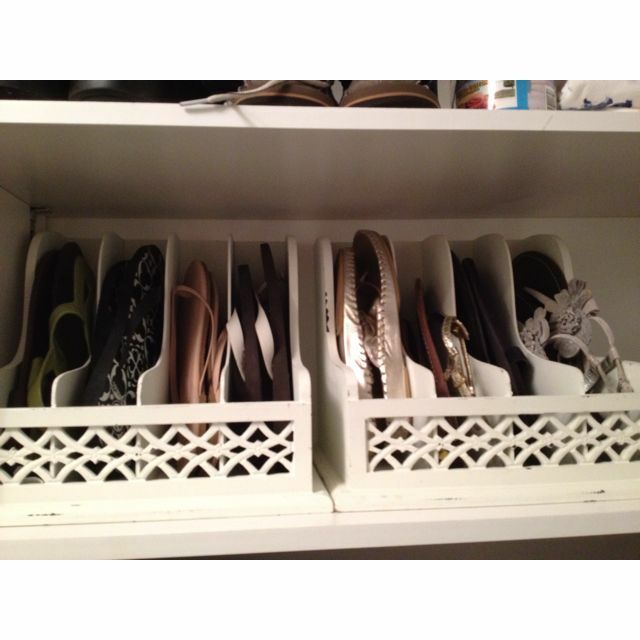 Turn a half-gallon of milk into shoe shelves for stackable shoe storage. 30. Turn an old photo album into an art kit. 31. Turn an old honey bear container into an adorable vase. 32. Or stick a straw in it and turn it into a sippy cup. 33. Roll a toilet paper tube in peanut butter and bird seeds to make a bird feeder. 34. Use a letter sorter to hold lids and plates in the kitchen. 35. Use Frappuccino bottles to store bulk spices. 36. Use a mesh laundry bag to hold small items in your dishwasher. 37. Use an old candlestick to hold bracelets. 38. Turn cereal boxes into plastic lid holders. 39. Hang a basket to hold towels. 40. An upside-down table becomes a toddler bed. 41. A gallon jug becomes a clever paint and brush holder. 42. Turn a crib into a table by adding a glass top. Flip one side of the railing to become a shelf. 43. Use rope to cover ugly wires. 44. Turn old baby food jars into a spice rack. 45. Use jars as easy picture frames. 46. Perfume bottles make gorgeous vases. 47. Turn a picture frame into a desk organizer. 48. Use a pepper grinder as an Oreo topping dispenser. 49. Use wine corks as a bag closer. 50. Use an empty wipes container to store plastic bags. 51. Use bread tags to label loose keys.